Vicky Martin collapsed after playing a gig in London at the Slaughtered lamb. Despite every effort from the medics they were not able to revive her. It had been an enjoyable gig and she was in good spirits. We hope at some point in the future to be able continue to keep the music and songs she made alive though it will never be the same again as she was a one of a kind. THE DELTA LADIES are a renowned multi-instrumental roots and world music duo – Vi Martin & Dee Stone. Their electro acoustic shows are noted throughout the UK and France. Vi Martin plays Guitar, Bouzouki, Chromatic Dulcimer and Banjo. Dee Stone plays Fiddle plus keys and piano. Their mesmerizing, rhythmic fusion of Roots, World, Folk and Blues rhythms has been christened ‘Hillbilly Trance’. Described by the wise man of roots and Americana radio BARRY MARSHALL EVERITT of House of Mercy Radio‘ as Unique and brilliant’ The sound adapts equally to fully acoustic venues and larger amplified venues. THE DELTA LADIES are joined regularly by percussionist DANNY BRYAN (Bex Marshall) whose dazzling array of world percussion creates a driving poly-rhythmic, multi timbral sound-scape. Most recently the band has been augemented with PHIL UNDERWOOD (accordion and multi-instrumentalist) (Creole Brothers/Kara) ALAN GLEN (Nine Below Zero, Yardbirds) award winning harmonica player features regularly. TALI TROW (Bonnie Dobson, Coal Porters, Cosmic Charlie) adds double bass & mandolin and is also currently producing tracks for a further projected Delta Ladies’ album. The band has been described as ‘Very good indeed’ by Steeleye Span (a folk act of almost mythical status) who were entranced by the Deltas at a recent major festival. 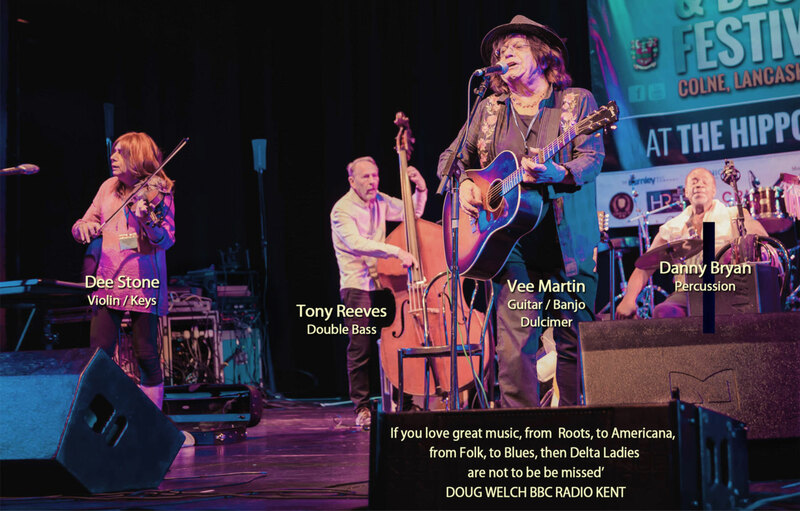 Among a large number of positive reviews; one the UK’s leading folk magazines AROUND KENT FOLK said ‘Mesmerizing and brilliant .‘ They then added the comment ‘You can almost smell the incense’. As a homage to the psychedelic era one of their new album tracks is the Deltas’ extended version of the classic Bonnie Dobson song ‘Morning Dew’ which was premiered on Radio Seagull in the spring of this year. The DELTA LADIES were recently filmed in concert at the Convent Glocs for PPV TV. They are also regular performers at the world famous 100 Club and will be appearing on November 15 this year. They have played close to 2000 shows in the UK and France including, the Famous Eel Pie Club (home of British Blues), Freddie’s Joint Toulouse, Bulls Head Barnes, Cambridge Folk Club, Blues at the Farm, Islington & Dartford Folk Clubs. Festivals include Ealing Blues, The Great British Folk Festival in Skegness, Tenterden Folk Fest, South London Folk Blues, Harpenden World Folk & Roots, Cambridge Rock Fest, Upton Acoustic, Brownstock, They have been backing band for Linda Gail Lewis and support slots have included Chris Farlowe, Lindisfarne, and Fairport. The Delta Ladies are recognized for the social comment and political edge of their music. In particular their film of the title track of their ‘Refugee’ album and the short film ‘Redcar Blues’ both of which can be found on the video section of their website. The DELTA LADIES have a well earned reputation for excellent, varied and entertaining shows ‘A great live act’ MAVERICK MAGAZINE, with Diana Stone’s fiddle showcases, and their American Roots hoe-downs among many highlights. "The addition of Phil Underwood on accordion added a stunning dimension to the bands sound"